Carcassonne is a city in the Aude département of the Languedoc-Roussillon region in the South of France. The modern city is build around two medieval cities, the original hill top Cité of Carcassonne on the north side of the river Aude, and the thirteenth century Bastide of Carcassonne on the South side of the River Aude. The older Cité is a spectacular walled town – the largest medieval town in Europe with its city walls intact. The Cité of Carcassonne is a UNESCO World Heritage site and the setting for many films featuring medieval castles. It is one of the few sights in the world that genuinely justifies the epithet "breath taking". In recent years it has become a major tourist attraction, with all that that entails. The French word cité does translate as city. It translates as walled town. This explains why you will find even small towns like Alet-les-Bains referred to as cités, and also why the cité in Carcassonne occupies only a tiny area of the modern city. The present cité is essentially medieval, although there are traces of older structures, for example some of the towers on the inner ring of defensive walls still retain their distinctive Roman shape and even their Roman foundations. Inside the Cité may be found the Basilica of St-Nazaire, once a cathedral (the new cathedral is a much less impressive building in the Bastide of Carcassonne). The French expelled the inhabitants of the original Cité, not trusting them to help maintain the place against allies of the dispossessed Trencavel family. The citizens were permitted to build a new and indefencible town on a plain across the the river Aude. Itwas laid out in the latest fashion in a grid pattern and known as the Bastide de Saint Louis (after King Louis IX of France). Today the bastide has been swallowed by the modern city, but you can still make out the layout of the road grid. In 122 BC the Romans invaded the areas that we now know as Provence and Languedoc. Recognising its strategic importance Carcassonne fortified the hilltop around 100 BC and later made it the colonia of Julia Carsaco, later Carcasum. The lower courses of the inner ring of ramparts to the north date from Gallo-Roman times. This Roman settlement was occupied until the mid 5th century AD when it, along with Spain, fell to the Visigoths, invaders originally from the banks of the Danube. The Visigothic king Theodoric II took Carcassonne in 453, and a few years later in 462 the Romans ceded the whole area (Septimania) too. Theodoric built further fortifications at Carcassonne, now a frontier post on the northern marches of his kingdom. Traces of these fortifications still stand. Theodoric, an Arian Christian, is thought to have begun the building of a church now replaced by the basilica in the Cité dedicated to Saint Nazaire. In 508 the Visigoths repelled attacks of the Frankish king Clovis. Moors ("Saracens") from Barcelona took Carcassonne in 725, but the Franks soon returned and in 759. King Peppin the Younger drove most of the Moors away. By 760, Peppin had taken most of what is now the south of France, although he was unable to penetrate Carcassonne. Carcassonne remained under Visigothic rule from 460 to 725. A Visigothic walled city was built in the 5th century by Euric I, King of the Visigoths. In 508 it withstood attack by Frankish king, Clovis I, but fell to the Moors in 725. The Moorish walled city was renamed Carchachouna. A generation or so later, in 752, the Moors gave way to the Caroligian king, P�pin the Short, who did manage to take Carcassonne, making it a Frankish City. In 1067 Carcassonne became, through marriage, the property of Raymond Bernard Trencavel, viscount of Albi and Nîmes. In the following centuries the Trencavel family allied in succession either with the Counts of Barcelona (later Kings of Aragon) or with the House of Toulouse. They built the Château Comtal and the Basilica of Saint-Nazaire. 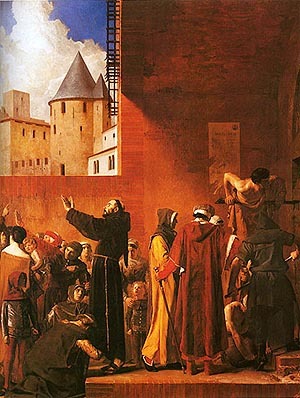 In 1096 Pope Urban II blessed the foundation stones of the new Catholic cathedral. For over a century the Medieval city of Carcassona enjoyed tremendous influence under the Trencavel family. This was brought to an end during the disasterous wars against the Cathars of the Languedoc. One of the important events in the first stages of the war was the siege of Carcassonne. 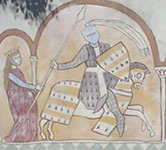 In August 1209 the crusading army of Arnaud Amaury (not as is often claimed Simon de Montfort) forced its citizens to surrender having siezed Raymond-Roger Trencavel during a truce. Raymond Roger was murdered, or at least left to die, in his own prison, and Simon de Montfort was appointed the new viscount. De Montfort added to the fortifications. At the end of the wars the Languedoc was annexed by the French crown. Carcassona became a French city called Carcassonne. In 1240 Raymond-Roger's son tried to reconquer his inheritance, but in vain. The city submitted to the rule of kingdom of France, though there would be more attempted rebellions into modern times as the local people attempted to return to their traditional allegence to the Kings of Aragon, the Trencavels' suzerains. On the left you can see some of the stones projected into the city by siege engines (perriers). Some of the projectiles were twenty times this size - designed to splinter like schrapnel. Louis (Saint Louis) and his successor Philip III built the present outer ramparts of the old Cité. Opinion at the time considered the fortress to be impregnable. In 1348 the Black Death struck the Languedoc as it spead across Europe through Italian trade routes. Around 40% of the population died. As in other cities, local Christian leaders invented stories that the disease was caused by infected well water and that wells had been poisoned by Jews. As in Narbonne and other cities, surviving members of the local Jewish community were burned alive for these imaginary crimes. A few years later the English tested Carcassonne's claim to be impregnable. When Edward the Black Prince attacked Carcassonne in 1355 during the Hundred Years' War, his troops destroyed the Ville Basse without much trouble, but he failed to take the old Cité. Carcassonne continued to hold strategic value, now for the French as a central and second line of defence against the Spanish. A series of border castles known as the five sons of Carcassonne (Queribus, Termes, Aguila, Peyrepertuse and Puilaurens) provided the first line of defence. In 1659, under the Treaty of the Pyrenees the Roussillon passed from Aragon to France. This meant that the Franco-Spanish border shifted south. The border castles were no longer border castles and a new set of fortifications were built under de Vauban. Carcassonne's strategic importance was reduced and it was allowed to fall into disrepair. There is no fee to enter the Cite - this is a working town with private houses, shops, hotels, and restarants. It also has an impressive open air theatre inside the city walls. The Cité is heavily geared to tourism, so you can expect tourist shops (jewellers, souvenirs, fashion, "Cathar heritage", art, etc) - generally overpriced and indistinguishable from tourist shops pretty much anywhere in the world. It is not its shops that make Carcassonne worth visiting. Carcassonne lies on the Canal du Midi, built by Pierre-Paul Riquet a notable Languedoc resident. The Canal is popular for boating holidays and through France's extensive canal network provides a way to get to the Languedoc from the Atlantic Ocean, Northern France and Mediterranean Sea. In Riquet's original plans the canal, then called the Royal Canal, passed to the north of Carcassonne using the bed of the River Fresquel. 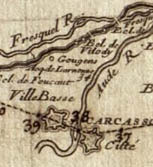 Riquet negotiated with the city fathers to route the canal through Carcassonne if they would meet the costs involved. They declined and Riquet was obliged to return to his original plan. So it was that Riquet's canal originally by-passed Carcassonne and followed the river Fresquel. As the canal passed Carcassonne so too the massive increase in trade enjoyed by towns on the canal also passed Carcassonne by. The great military engineer Mareshal de Vauban surveyed the canal and recommended a link to Carcassonne but nothing was to come of it for many years. Eventually a decision was taken to re-route the canal and it was re-engineered to pass along its present route. It opened in 1810, some 150 years after the original canal had been built. If you are interesed in history, architecture or canals you can spend some enjoyable time tracing the canal's old route to the north of Carcassonne - there is an excellent article on it, with photographs, at http://www.moet-chandon.co.uk/pages/canal-du-midi.php. Carcassonneis in the Aude département of which it is the préfecture, in the former Province of Languedoc and the present region of Languedoc-Rousillon. It is located in the between the Black Mountains and the Pyrénées. It lies on important routes connecting the Atlantic Ocean to the Mediterranean Sea; and Spain to France and Italy. The River Aude flows north from the the Pyrenees ( Pirenèus, Pirineus, Pyrénées) to the city and then east into the Gulf of Lyon. The town lies 90 km (56 miles) south-east of Toulouse, just a few kilometers inland from Narbonne. 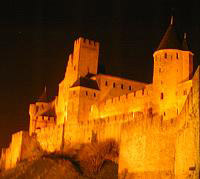 The folk etymology of the name Carcassonne is endearing and widely believed. According to the story a châtelaine of the city, named Carcas, foiled a attempted seige by the Franks or in some versions the Saracens. At the point of having to surrender through starvation Carcas found the last animal alive in the city - a pig - and fed it with all of the remaining vegetables and offal that remained. She then threw the well fattened pig over the walls as a present to the beseigers who, as planned, deduced that the city was well provisioned and seeing no prospect of the city's surrender, upped camp and left. According to this apocryphal story the bells rang out in celebration, giving the city a new name - ("Carcas sona"). A neo-Gothic sculpture of Dame Carcas on a column near the Narbonne Gate is modern. (Gate shown upper left, detail upper right), which has led some people to believe that the story is as modern as the sculpure. In fact the sculpture is a replacement for a much older one that is now kept inside the château comtal. Though badly worn it is just about recognisable (upper far right). A major part of Carcassonne's income comes from tourism connected with the Cité and with other local attractions such as boat cruises on the Canal du Midi. Carcassonne receives about three million visitors each year. In the late 1990s Carcassonne airport started taking budget flights to and from European airports, and Carcassonne airport (called Salvasa) has grown substancially since then. Carcassonne lies near to a number of major AOC wine-growing areas in the Languedoc Roussillon. The newer part of the city around the Ville Basse manufactures shoes, rubber and textiles. The City is now a major tourist attraction, and therefore best avoided in the summer, when it fills up with package tourists who imagine themselves to be in an early version of Disneyland. 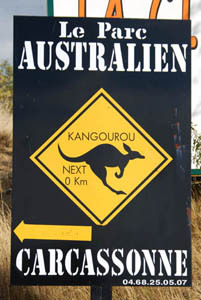 If you like fantasy, you can also visit an Australian Game Park nearby (see right). The Ville Basse still contains most of Carcassonne's business activity and is interesting in its own right. It is also a Medieval cite but was largely rebuilt in the Seventeenth Century. Ramparts. The Cité outer ramparts, complete with turrets, towers, and crenellations, were built during the reign of Louis IX. His son, Philip III, continued the work. He also added a main gate, called the Porte Narbonnaise, to the inner walls. The Porte is the only entry into the Cité by road. It is guarded by two flanking towers and a double barbican. Château Comtal. 12th century castle belong to the Counts. It is located within the Cité's ramparts. Its fortifications are among Europe's finest medieval remains. You can take a guided tour, but don't expect too much by way of historical expertise. Church of Saint Nazaire. An 11th to 14th century Romanesque and Gothic Church, also located within the ramparts of the Cité, once a cathedral and still feeling like one, built by the Viscounts of Carcassonne. Church of Saint Vincent. (Eglise St-Vincent). Ville Basse. Thirteenth century. Bastide Saint-Louis . (Eglise St-Vincent). The original Ville Basse and the centre of the modern one. Fourteenth century. Works of artists in and around Carcassonne include those of Violet-le-Duc (1814-1879) the architect largely responsible for the restoration of the Cité; Jean-Paul Laurens (1838 – 1921) who painted events at Carcassonne from the Cathar period, Edouard Bernard Debat-Ponsan (1847-1913); Achille Laugé (1861 - 1944) who lived and painted in the nearby village of Cailhau; and Anthony Murphy (1950 - 1944) a contemporary artist. Cycling is big in Carcassonne, as throughout France. (It is the national sport). Carcassonne features most year in the Tour de France. It was the starting point for a stage in the 2004 and an endpoint in the 2006. Rugby League is very popular in Carcassonne, as elsewhere in the Languedoc-Roussillon (a reaction to Petain's attempt during the time of Vichy France to make the game illegal). The city often hosts the Grand Final as well as International Test matches. The local team is AS Carcassonne. They often perform well in the French rugby league championship and often compete in the Challenge Cup in England. Salons - Foires. (Fair) 6 March. F�te du Cochon. Pig festival in March. Festival de Carcassonne. Dance, Theatre, Music: July. Estivales d'orgue de la Cit�. (Organ recitals): June to December. Embrasement de la Cit� et Feu d'artifice. (Fireworks on bastille Day): 14 July from 2230. Spectacles m�di�vaux dans la Cit� M�di�vale (Medieval spectacles in the Cit�): August. Fiesta y Toros, corridas, bandas, (Spanish week): August. Foire au gras. (Fair): December. Carcassonne as a UNESCO World Heritage Site. Carcassonne is the name of a board game created by Klaus-Jürgen Wrede in 2000. In it 2-5 players develop the area by strategically placing land tiles on the board.